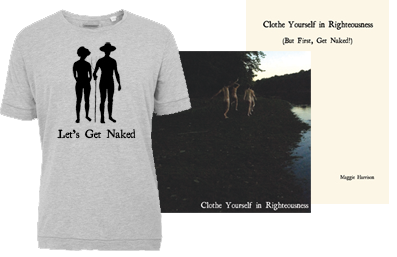 A few weeks ago, Jon talked with Mark Helpsmeet of Northern Spirit Radio about the Clothe Yourself in Righteousness project. Click Here to open up the interview. Please leave a comment if you like the interview! Comments help promote the show and therefore allow more people to hear it. Mark: I would like to invite you to a soul-level encounter. Music has an incredible ability to proclaim the soul’s language beyond what mere words can speak. That’s what we seek as we invite our guests to share the song of their soul. You’ll hear the music that has charted the steps of their spiritual journey, that has provided a touchstone in the soul’s dark night and sung the heart’s awe and joy when come to the light. Over the next hour, you will be a witness and companion to our guests’ spiritual path and sacred testimony. Welcome to Song of the Soul. Today for Song of the Soul, we continue our visit with Jon Watts and his Clothe Yourself In Righteousness project. Last week we got naked in preparation for re-clothing ourselves. Now we explore with Jon and his inimical style of spoken word poetry/music what happens when you make the transition. Jon is a deep thinker and explorer of the spiritual and musical realms. So rest assured you’ll get some depth and breadth of vision in the listening. And on a side note, I spoke to Jon a week and a half ago and in the interim I contracted one of the diseases a radio announcer dreads – a cold. So though my voice is rocky and sometimes barely there, the show must go on. I’ll try to be better for you next week but in the meantime, settle back, take some slow time to swim on the deep end of the spirit pool and listen to Jon Watts drawing from his newly released Clothe Yourself In Righteousness project. Jon Watts: So the early Friends were my ‘in’ to the Bible. The environment in which I grew up in was not conducive to studying Christianity and in a lot of ways I would say that Christianity has a pretty bad rap right now, like the sort of political movement of Christian evangelicals is giving the whole thing a pretty bad name. So I’ve been really hesitant in my life to even go there. There’s been a lot of barriers in between me and Christianity and really embracing words like God. It took me a long time to be able to say a word like God and mean it in a way that I felt was authentic and it’s not even something that I felt like was worth working on, because they’ve taken it, it’s gone, when you say that it conjures this image of some big, white guy in the sky manipulating everything and that’s not real. That doesn’t exist so why should we say the word? But as I started to explore my own personal spirituality, I realized the word is so important or at least the concept, I mean what do you call that body that we’re a part of? What do you call that thing that we serve? I started with saying, well, it’s the Infinite or it’s the Universe or it’s the Planet but it’s not the self, it’s not anything secular. It’s not anything secular. I do think it can be explained in science but we don’t have an explanation for it right now and it’s the mystery, it is a mystery and it’s a mystery that we’re interacting with or that we can be and that we all have access to. So I’ve been trying to sort of reclaim that word God and in exploring the early Friends I’ve felt called in my own way to start exploring the Bible and Scripture and one of the ways that I’m doing that is through my art. It’s sort of welcoming in especially in this moment, in this poem, just welcoming that ancient wisdom that was originally written in Hebrew by people who existed in the present. You know there was a moment when the Bible stories that we know now were being told word of mouth in the present moment and they were alive. That same thing of trying to use that language but bring it in to a context in which I feel like it’s expressing something for me. Feels like work that I’m called to and maybe just starting to explore. Mark: I like your exploration. Let’s explore a little bit more of your music. Jon Watts: The next thing I’d like to share is a couplet of songs. It’s two songs that sort of go hand in hand. Their names are ‘Lifted Up’ and ‘The Burden Of Vision’. The songs are… they’re very personal for me. The first one is first person, ‘Lifted Up’ is first person, and ‘The Burden Of Vision’ is third person but they both feel like… they’re both stories that I’m holding really deeply in my heart. And the seed of the songs… well let me tell a story real quick. So as I was reading back over the story of James Naylor who was the early Quaker in the 17th century who went into Bristol and got arrested and tried in front of Parliament and whipped through the streets of London: it happened several times in the story that James Naylor became depressed or he became unspoken and I tell this story a little bit in ‘Don’t Doff Your Hat’. But he would go for days without speaking or eating or sleeping and if someone did that nowadays, we would say, oh wow, that person is probably bipolar or depressed or needs medication or something like that and yet it was this, the way that the early Friends would describe it is sort of this burden of God that if God is calling you to something and you’re having this wrestling match with God about not wanting to do what you’re being called to do, wanting to say no, wanting to not hear that message, so that can be very heavy, that we can sink into a very difficult place in those times. And in my songwriting what I’ve found is that sometimes I do this sinking. I do this exploration of pain in the song and it’s almost what’s most natural for me is this crying out to God, this crying out to the universe about the pain that I’m feeling and what I say in the beginning of this song that I’m about to share with you, ‘Lifted Up’ is no, I’m going to make this a prayer of gratefulness, the rest of the song is dedicated to our closeness, to our connection, to our hopefulness. And in the remainder of the song I explore this concept of the value of our sadness and the value of the weight that we can feel in the universe and in this world and in this culture. It’s very real. Grieving is very important. I can’t say that with enough emphasis and we jut skip right by it, we don’t want to do it. We want to take a medication, we want to present ourselves… we want to clothe ourselves in the world, in happiness, and joy and present to the world someone who is together and with it and doesn’t feel emotions that are arresting. But we have emotions and we have leadings that are arresting, that we need to sit with and we need to take a moment with and that we need to give our full attention to and be distracted by and be in a place of hurt or sadness because that’s the only way we can get the healing. If we ignore it then the place we’re going to go is a place of inauthenticity, we’re going to hold onto that emotion, we’re just going to hide it somewhere in our body, in our muscles or whatever so both ‘Lifted Up’ and ‘The Burden Of Vision’ which I’d like to play for you now are exploring this concept of the value of grief, the value of sadness and what our culture has done with that and embodying this way that art can be our way to navigate through that. 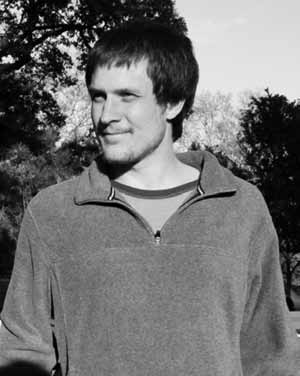 Mark: A couplet of songs by Jon Watts, ‘Lifted Up’ and the one you just heard, ‘The Burden Of Vision’, both from his latest release, you can find out all about it, you can see videos related to it at www.ClotheYourselfInRighteousness.com He is Jon Watts. J-O-N-W-A-T-T-S. Jon, I did want to have a couple of comments about those songs. One of them was that in the ‘Lifted Up’… I’ve known you for some years and so I have some sense of who you are but I was trying to sort out what you meant by the phrase, “I salute the Amish and all the other life-affirming products of considering our tolerance for process.” That one bent my mind. I was doing a word diagram, wasn’t sure what I was going to come up with. But I have some sense of the Amish because I think one of the things you did on your performing tour, at one point, you were doing it by bike. You talk about reducing your carbon footprint. So I assume it’s connected with some of that but what did you mean? Do you know what you meant? Jon Watts: I know what I meant, yeah. Thank you for asking. Well, the bike reference that you’re making is the simplicity thing. I did do my last tour on a bike rather than in a car and what I found was that it was really rather than reducing my carbon footprint and the focus on the negative impact of our culture and society on the natural world, I was focusing on the things like just being in the world. What was amazing about that trip was that I got to use my body, I got to be outside, I got to interact with the places that I was traveling through. So simplicity isn’t just something that we should do out of guilt. Simplicity is something that improves our lives in a deep way. So that’s the first thing I want to say about that. The Amish line… “I salute the Amish and all the other life-affirming products of considering our tolerance for process.” So Max Carter, I just keep referencing Max Carter in this interview and I want to say that Max has been… Max’s stories and his presence have been the seeds for so many songs for me and so many projects that have changed my life, and there’s just a long list. There’s a long list of elders in my life, elders and mentors and people who have been on this spiritual journey with me who have planted all these seeds in my life for these things, these stories to exist and this journey to be as rich as it is. And after I talk a little bit about the Amish story, about how Max Carter planted that seed I’d love for us to play ‘Giving Life Leaves Marks’ to close things out here. At the end of ‘Giving life Leaves Marks’ I list off all of these elders and mentors and fellow spiritual adventurers who have made this journey so rich and planted all these seeds for me and that song is about the seeds that have been planted and how they’re sprouting now and also my own personal process of thinking about how I’m planting seeds, and how it feels to be planting seeds and what it means and what our relationship with planting seeds is. So it’s a really vibrant exploration of the past, the present and the future. So the story that Max told me about the Amish, and I don’t know if this was a particular Amish community or if this was sort of… I don’t really understand how the structures work in the Amish community. I know that there are sort of different branches like there are in Quakerism so this might be a really simplified version of what happened. The story that I heard from Max was about cell phones, about technology, about how new technology is introduced to the Amish, and my assumption was that the Amish have just said, “No new technology! We’re going to use our ploughs and our wagons and our barns and we’re sticking to that, we’re sticking by our guns no matter what cool stuff you guys come out with. We’re not even going to look at an i-phone or whatever.” But the truth is and the story that Max Carter told me is that the Amish communities take on new technologies and have a trial period for them in which they had cell phones for maybe a couple of months or something. And then they get together as a community and make a decision (laughs). They get together and they say how did this affect the body? Was this a healthy addition to the body? Was this sustaining for us? Or was this an unhealthy addition to the body? And is this going to break us apart? They just make a decision; they have a conversation about it. Whereas out here in the mainstream culture you know we’re just wildly thrown from one direction to the other by the corporations who are coming up with these new technologies and the corporations that are making the decisions about how we’re going to use them. And they’re deeply affecting our communities. The cell phones, the Facebook and YouTube and Twitter. All of these things are just jostling us in one direction to the other and interact. And what I heard from the story is that we can have a more intentional relationship with technology, that these technologies if we acknowledge that they really affect us and we also acknowledge that we’re a part of the body then we can make a healthy, rational decision about how and when to accept these technologies into our communities. And so, “I salute the Amish and all the other life-affirming products of considering our tolerance for process.” So you know a lot of people complain about the Quaker business process because it takes a long time and we have to sit in silence for a long time and listen to people who we wouldn’t really want to hear from necessarily and we all wish it could be sped up and that we had to have less patience for it and that we could make decisions faster, but process is so important. Mark: Wow, you’ve really been thinking deeply, and I think in a lot of ways you stand for what’s best, in my opinion, in engaging with religion and spirituality. I don’t get the sense that you feel like you have to do anything except you feel called in a direction, that’s how I take what I see from you. It’s not like “I should…”, “I should look this way”, or “I should be this way”,” I should speak this way”. You’re testing a leading and if I’m giving you too much credit, tell me to shut up but that’s how I end up seeing it. Jon Watts: Well it’s certainly… I mean, well that’s the burden of vision, right? To be given something by God and God says if you do this, it will affect things; if you follow me and you listen to me that’s what would be best for the body. And I say, “ok God,” you know, it’s easy to say, “ok God, I want to do your will or you know, make me your servant.” But then God asks you to get naked in a public square in England in the 17th century, and you’re like, “oh God, seriously?” I didn’t know it was going to be like that. So the ‘should’ and ‘should not’… I made a realization at some point in my life that I want the kingdom of heaven on earth. You know, we have this culture of making decisions around what we want to do. Like what do I want right now? I want chocolate. I want to nap. I want to interact with pretty women and these are all things that my ego wants, my body wants, and it’s the superficial and we’re often driven by that in this culture. That‘s what we’re listening to when we don’t have God. That’s what we’re listening to when we don’t have a greater sense of the body and how we fit into it and what I realized is that yes, I want all of that stuff in the short term. I want sugar, basically I want processed sugar but that it doesn’t make me feel good tomorrow or even in two hours I’m not going to feel great about that decision and my teeth might rot out. And so in twenty years that’s not probably the best decision for me and when you take it further, what’s the best decision for our children? And we’re all having this conversation now about how to change the impact of our industrial society on the earth and how not changing it is going to affect our children and our children’s children. But what about the entire body that we’re a part of which includes the future of our species? If we are in a loving relationship with God, then we want what’s best for God and ultimately that’s selfish. I mean ultimately what we deeply want is to be loved and to be understood and to be in right relationship with the body that we’re a part of. I mean that’s ultimately what best for each of us, not sugar, not whatever it is that we want right now. Mark: I think it’s probably a good thing that this is not sponsored by a sugar company, I guess, this program. Jon Watts: High fructose corn syrup. You can’t make that realization, that what I want right now isn’t necessarily what’s best for me or what’s best for the body that I’m a part of and that what’s best for the body that I’m a part of is what’s best for me, you can’t make that realization without making a radical commitment, in my opinion, making a radical commitment to listening to what the body needs, to what God is calling you to do, to what’s most healthy and to what’s most likely to move us toward the kingdom of heaven on earth. So ‘should’ and ‘should not’ that feels like some sort of external stuff or guilt stuff when really it’s what’s best for me is what’s best for God and so I’m listening for what’s best for God and I’m trying to do that. Mark: And I love watching it happen. But you spoke of concluding with a specific song. You want to say anything more about that? So we have yet to really sit down… she said that she listened to it in the car the other day and she thanked me for it. But it’s this deep relationship with where we came from, where we’re going, and then sort of right in the middle of the song what came through me was to talk a little bit about how we do that, how early Quakers have taught us how to do that. Then this John Woolman quote of letting love be the first motion, focusing on love, letting love guide us. The title of the song is ‘Giving Life Leaves Marks’ and it’s a literal pregnancy thing that that literally leaves marks on your body. And also that this project has been me giving birth to this thing that I’ve been pregnant with for quite a while as we said at the beginning of the interview and it has totally left its mark on my life. My life has changed dramatically because of this art that has come through me. Mark: From the Clothe Yourself In Righteousness project, the song is ‘Giving Life Leaves Marks’, Jon Watts. Let’s listen. Jon Watts: You know what, Mark, I was just a hard teenager and if she was here she would agree with that assessment. Mark: And does this relate to the line from ‘Friend Speaks My Mind’, “I got down with some funky behavior…”? Is that a bit about it? Jon Watts: That’s fair, that’s fair. Actually my mom was what we call, a Friendly Adult Presence at the Young Friends conferences that I went to when I grew up. And she was amazing. It was a space in which I called her “Peggy”, I stopped calling her “Mom” and she called me “Jon” even though she loves calling me “Jonathan” which is my birth name. And we were able to have this very formal relationship which released us from judgment of one another so the funky behavior, she aided and abetted, I have to say. But that was in the later stages of my teenage years and that was when we sort of really solidified our relationship as, I guess, peers or as people who could relate to each other as people instead of as roles. So often we’re in these roles with our parents and children where we still struggle with this, “She’s my mom, she’s my parent,” and she knew me when I was a baby and she’s having trouble adjusting to the fact that I’m not a baby and I’m having trouble adjusting to the fact that I’m not a baby. But my early teenage years we hadn’t found that connection yet of going to these Young Friend conferences and fully loving and holding each other without the restrictions of the roles of how we had been put into each other’s lives which created a deep relationship between us, but before that and in between conferences there were some… But anyone who’s had teenagers or has been a teenager knows that that’s a difficult time and as I’m sure you’ve garnered from this interview, I can be intense. I have intense emotions and intense passions and I’ve had a lot of … one of the things that all the elders in my life have done is helped to shape that, helped to shape that passion and provide the loving foundation and joy that that can spring from to be a gift in the world but as a teenager, before any shaping of that, it’s kind of random and it’s out of control, and if I was angry or hurting about something and not knowing how to express it, just being a really passionate person and that I was really intense. And we had some really intense times together around that. Mark: Well I thank you for the intense times today listening to your music. And hearing what’s behind it. I love the currents that I see flowing through you. Thanks for teaching us, leading us, being faithful to the ministry you’re called to. Thanks for joining me for ‘Song of the Soul’. Jon Watts: Thanks so much for having me, Mark. Mark: So that was the end of my visit with Jon Watts on his Clothe Yourself In Righteousness project. Find out more, see the videos and much more at www.ClotheYourselfInRighteousness.com or just follow the link from www.NorthernSpiritRadio.org. So though the interview is over we still have several more minutes to share so I’m going to play some more of Jon’s music. 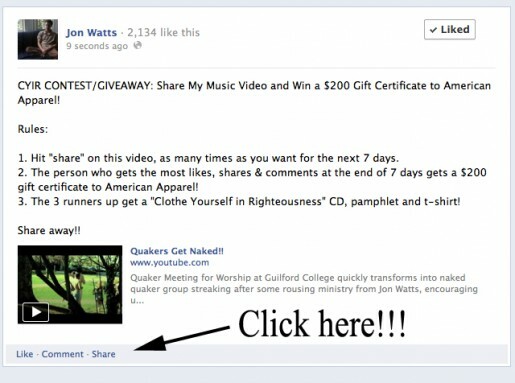 You heard mention last week of the somewhat viral, at least by Quaker standards, of the video that Jon released called ‘Dance Party Erupts During Quaker Meeting For Worship’. Well it’s based on Jon’s song, ‘Friend Speaks My Mind’, so I thought you’d appreciate a chance to hear the full song. Here it is. ‘Friend Speaks My Mind’. Jon Watts. Mark: ‘Friend Speaks My Mind’ from Jon Watts’ CD ‘The Art Of Fully Being’. Let’s go out with today’s Song Of The Soul with one more song by Jon, another of my favorites from The Art Of Fully Being. It’s called ‘We Are Lovers Of Our Lost Earth’ and the mantra I carry with me from this song is “Inhale exhaust, exhale love. Calling us to a profound alchemy of spirit.” By Jon Watts. After several months traveling and promoting Clothe Yourself in Righteousness, Maggie and I are back in West Philly for a brief month before we part ways again. I thought it would be a good opportunity to give away some copies of the CD, Pamphlet and t-shirt. And maybe spread the word about the music video a bit! A $200 Gift Certificate to American Apparel!! All you have to do is share my music video on facebook, and get your friends to like and comment on it! In the first few days after Maggie’s recent blog post, we realized that she had hit a nerve as the comments just kept coming in. That realization deepened over the following days, as we started to see blog entries popping up in response. We’ve been sharing them as we see them on our Facebook page, but it seemed like a good idea to compile them here for our readers to peruse. If you know of others, please feel free to point them out in the comments section.